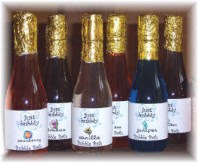 News and updates on the happenings at Just Bubbly. Here is the link to the live online segment from yesterday! Click on the picture to be taken there! Champagne Bubble Bath and Valentines Day Duckies were a hit! http://www.abc.com/ will be showing some of the latest Valentines Day bath and body creations from Just Bubbly™ live on Monday at 4pm and then all week on their website. Pop in to see our items as well as other Valentines Day gift possibilities available from other creative designers. With Valentine’s Day just a few days away, there is still enough time to get your romantic gift for that special someone. Romantic Kisses, Love, Champagne Dreams, and White Zinfandel are just a few of the fragrances of our Champagne Bubble Bath that are available for you to make that Valentine’s evening extra special. 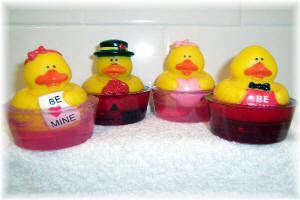 If bubble bath is not what your little Valentine is looking to receive—check out our Valentine Soap Duckie. Available in pink or red soap base and boy or girl duckie, these little guys are sure to be a hit for children of all ages. To be sure that your Valentines soaps or bubble bath arrives in time - be sure to order no later than Tuesday February 12th.